HD Kumaraswamy's Janata Dal Secular and Congress formed a coalition after the Karnataka assembly elections 2018 to stake claim. 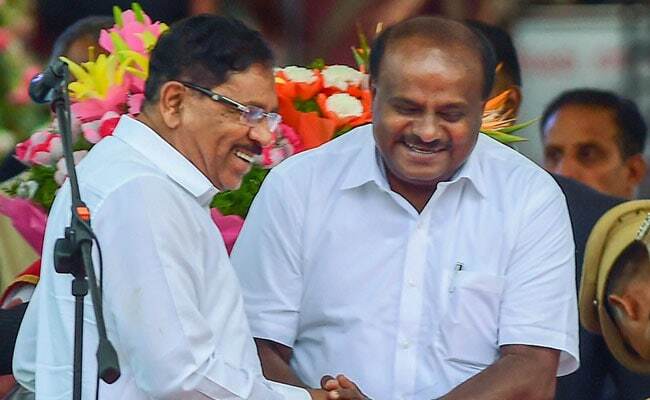 G Parameshwara (left) of the Congress was chosen as Karnataka Chief Minister HD Kumaraswamy's deputy. Soon after the alliance was invited to form government, there was a dispute over the post of deputy Chief Minister; the Congress wanted two. While Mr Parameshwara was already in line for the job, there were reports that DK Shivakumar, the Congress leader instrumental in keeping the party's flock of lawmakers intact in the face of alleged attempts to engineer defections, also expected the post. "Is it the same for those who win one seat and those who win the state? I have not come to politics to take sanyas. I will play chess, not football," Mr Shivakumar said, denying that he was upset.